An official inquiry has been launched into the removal of body tissue from 65 nuclear workers, Trade Secretary Alistair Darling has announced. He confirmed most of the deceased employees had worked at Sellafield, in Cumbria, between 1962 and 1991. The inquiry will ask why tissue was taken, whether next of kin were told and if proper procedures were followed. 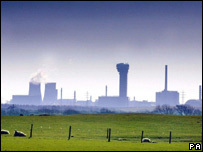 Sellafield's owner British Nuclear Group says tissue was taken for "legally correct" purposes. Mr Darling has appointed a lawyer, Michael Redfern QC, who led the investigation into the removal of children's organs at Alder Hey hospital , Liverpool, to investigate trade union claims permission was not sought to remove tissue, which included bones and body parts. In many cases the tissue was removed at the request of a coroner and was used to investigate the effects of radioactive material, said Mr Darling. "This is clearly a difficult situation covering events that took place up to 45 years ago. Nonetheless, we owe it to the families as well as to the general public to find out what happened and why," he told MPs. GMB union national officer Gary Smith said: "We said that there may be an issue here. "We need to find out what's happened to quantify what has occurred, if something has, and we said there needs to be a transparent process, an independent inquiry. "And that's exactly what the government have delivered." Mr Darling told MPs records at BNFL, which formerly operated the site, showed six of the workers were from Aldermaston and one was from a nuclear site at Capenhurst, in Cheshire, who had transferred from Sellafield. Other information - but not medical records - relates to a worker from Springfield, Lancashire. The rest worked at Sellafield. Mr Darling described Sellafield's records as being of "limited nature". "Because they are medical records which dealt with analysis carried out at Sellafield, they do not provide an audit trail which would show in every case who asked for such an examination, under what authority and for what purpose. "Nor do they disclose whether or not the appropriate consent from next of kin was received." The tissue was apparently examined to establish the cause of death - "but we cannot be sure of that because there is not an audit trail to establish that as a fact," Mr Darling said. The tissue was destroyed in the analytical process, he said. BNFL had told him the samples no longer existed but "they are not certain at this stage what procedures were followed". Of the samples, 23 were taken following a coroner's request, 33 after a post mortem, three were associated with legal proceedings and one was a biopsy from a living person. In four cases there is no information about how the request came about. Peter Lutchwyche from the British Nuclear Group said the samples ranged from small samples of tissues to organs. He added that after preliminary examination of the 65 records "there's no clear way to show why the samples were asked for and how that request was made." Conservative spokesman Charles Hendry said MPs were "shocked and incredulous at what appears to have happened". He welcomed the inquiry, saying: "This has to be the right way forward to alleviate the very great distress that will be felt today by all the families potentially involved." Liberal Democrat trade spokeswoman Susan Kramer said: "The government should now initiate a broader investigation into other existing and decommissioned nuclear facilities where other similar practices may have taken place. "The families of workers at other nuclear facilities will be looking for reassurance about this deeply disturbing revelation."